It’s been 26 years since Osman Chowdhury was almost killed by a gang in Bangladesh and fled to the United States. Chowdhury said he is still scared of being killed when he goes back to his native country. Osman Chowdhury in Bangladesh, 2008. Photo provided. 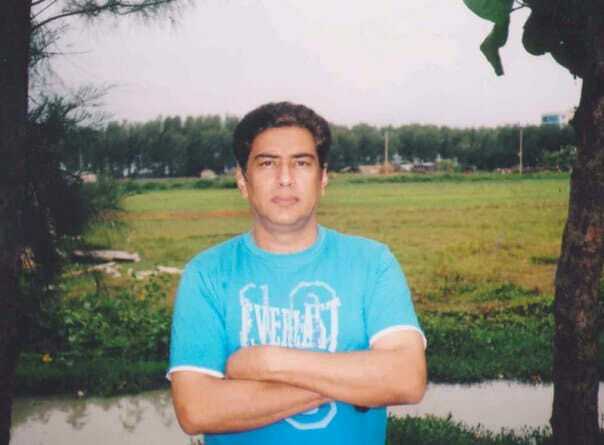 Chowdhury was 24 in 1991, when seven young men attacked him in Chittagong, in Southern Bangladesh, surprising him in second floor government office. They broke his nose and tried strangle him with his tie, he said. Chowdhury managed to escape, ran out to the streets and made it to a police station. “I had to save my life,” Chowdhury, now 52, said with a trembling voice. But the seven attackers pursued him inside the precinct, and officers were afraid of them and refused to press charges, Chowdhury said. At the hospital, the doctor didn’t want to help him either because the gang had called to threaten hospital employees. Now 52 years old, Chowdhury has never learned the identities of his attackers. He just believes they were “obsessed with money,” and hired by a rival political party to attack him. Back in the 1990s, Chowdhury was a member of the Jatiya Party, a centrist party created in 1986 by Lt. Gen. Hussain Muhammad Ershad, who had come to power in a military coup in 1982 and ruled Bangladesh under martial law for more than nine years. As a political activist, Chowdhury said he organized events and worked with the new party members. But when an anti-government movement contested the regime, and Ershad resigned in November 1990, Chowdhury became endangered, he said. He was a victim of an era of intense political instability in Bangladesh. “After Hussain Muhammad Ershad stepped down, there was a little bit of unrest in the society, in 1991, 1992 and 1993,” Dr. Amanullah Ferdous, a professor of sociology at the University of Dhaka, said in a phone interview. “Everybody tried to take revenge (against the party)”. In the months following the attack, Chowdhury said he hid at his sisters’ and brothers’ houses, all across Bangladesh – until he decided to flee. He said that in October 1992, he paid a smuggler $300,000 takas– now the equivalent of $3,615, more than 20 times the average income per month in Bangladesh today– and took an airplane to Toronto. There, a Spanish-speaking smuggler drove him to the American border with two other Bangladeshi men. He was left in a city he didn’t know the name of, and took a bus for New York City, where he obtained asylum after several years. More than 5.4 million people left Bangladesh in 1990 – most of them for economic reasons – and only about 21,400 went to the United States, according to the United Nations Population Division Department of Economic and Social Affairs. Today, between 600,000 and 700,000 Bangladeshis live in the United States, the International Organization for Migration said in a phone interview. Since he got his green card in 2008, Chowdhury has gone back four times to Bangladesh. He was still scared for his life, he said, because he has kept defending the Jatiya Party from New York. 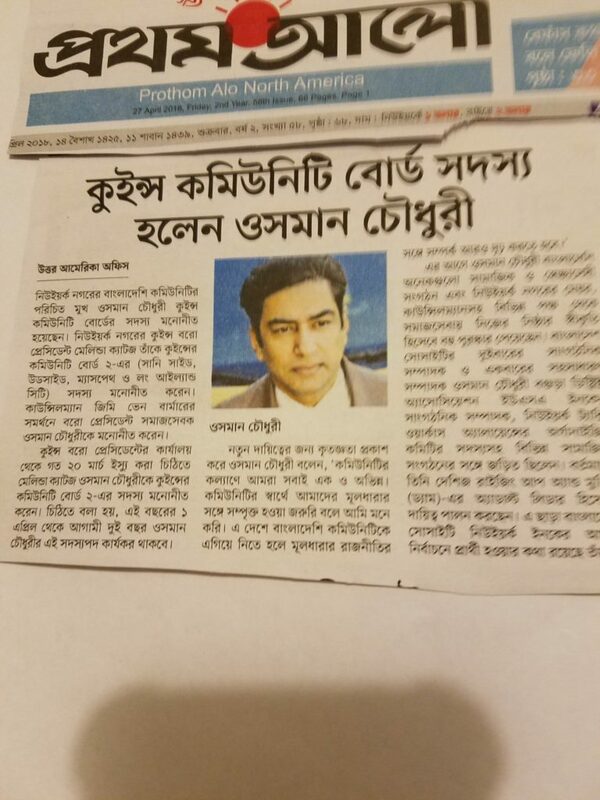 In the last 26 years, he has been in touch with local Bengali media outlets to denounce the government, and has become involved in the U.S. branch of the Jatiya Party. So when he went to visit his friends and family, he stayed at home – in different houses, so nobody could find him — and was careful when he went out. Human rights reports still depict an alarming political situation in Bangladesh, now ruled by a multi-party parliament system. Law enforcement agencies continued to arrest political activists and militant suspects in 2017, according to Amnesty International, which denounced disappearances and extra-judicial killings. Odhikar, an NGO based in Bangladesh, reported at least 86 disappearances and 154 extra-judicial killings in its 2017 annual report. At least 77 people were killed and 4,635 injured in political violence, the report also said. 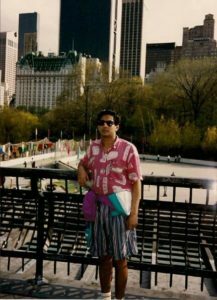 Osman Chowdhury in South Sea, just after he arrived in New York, 1992. Photo provided. But Chowdhury might not be a target anymore, according to Dr. Ferdous, who said the current political context in Bangladesh is totally different from the one in the 1990s. The Jatiya Party is much less influential than it used to be, since it has split into three factions after losing the parliamentary elections in 1996. But Chowdhury doesn’t want to hear that analysis. Academics may be manipulated by the government, he said, and he is convinced the situation is getting worse–not only for him, but for all the people in his country. He watches the Benglali news each day on Youtube, and calls his sisters three times each week in Bangladesh to make sure everything is okay. He burst into tears when he spoke about what he says Bangladeshis are going through. “When people go to work, they don’t know if they will get back home,” he said. 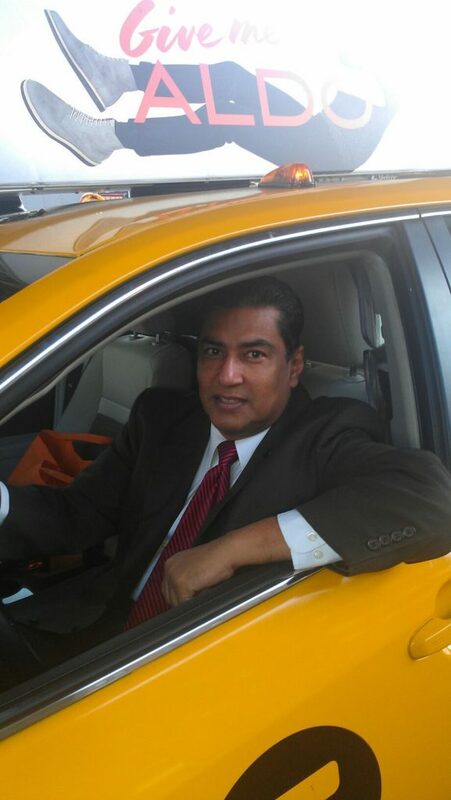 Osman Chowdhury has worked as a taxi driver in New York for 21 years. This violence Chowdhury describes doesn’t correspond to the current reality, according to Ahsanul Kabir, program manager at The Hunger Project, an NGO based in the capital Dhaka. “It is not true for general people. But it may be true for certain members of political parties,” he said in an email interview. This is not the first time NGOs and academics diverge from a refugee’s perspective, Sabrineh Ardalan, assistant director at the Harvard Immigration and Refugee Clinical Program, said in a phone interview. According to Ardalan, the NGO and advocates working on the ground may be more inclined to see the progress being made, which doesn’t mean the refugee’s fears have no foundation. “Those two realities can coexist,” she said. For Chowdhury, at least, the reality is one, and simple – if he goes back to Bangladesh and doesn’t hide, he will get killed.